We're pregnant! When those words come out from the mouth of a new mom and dad, there is an instant celebration for everyone that hears the news. So when it comes time to announce the arrival of the birth of your newborn, you might consider choosing from one of the photo birth announcements we have available for you at Polka Dot Design because we have an endless assortment of cute birth announcement for you to choose from. We really do believe that birth announcements are one of the most special pieces of memorabilia you will ever create for your little one. So take a little time beforehand to pick out your birth announcement, no need to stress, with the help of our customer service representatives, they will help you select your custom announcement that suits your taste perfectly. Whether it's a whimsical and colorful pattern play or an elegant monogram of the newborn's initials, we are sure to find the exact fit for you and your family to announce the arrival of your baby. 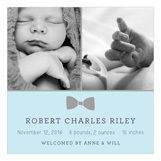 If you are looking to find the perfect baby shower invitation, great news, you have come to the right place, the custom baby shower invitations we have available are truly special and unique and many of them you won't find at any other place on the web because of our in-house design team that creates our private invitation collection. We also proudly host some of the nation's top stationery designers allowing you to choose nothing but the best for your photo birth announcements. As far as invitation printing services go we stand apart because we truly are like an online boutique and printing invitations is our passion and celebrating life with you is part of what we love most about what we do. So come check out our photo birth announcements and see which one draws you in and feels like you, then go ahead and make some notes about the different shots that you would like for your photographer to take of your newborn. Sometimes a simple black-and-white is all that you need to capture your little one's personality, you may even consider doing multiple photos, and idea for you is that you could do one of your child's smile, one of your newborn baby's feet, and one of their precious little hands. It's a really special way to memorialize all of the incredibly sweet details that make your baby unique and special to you. You absolutely don't want to skimp out on this opportunity and not send out your photo birth announcement, it's an absolute must. Make sure you order one extra for the baby book. We have learned firsthand that every child looks for their birth announcement in their baby book so don't be looking like a fool and not have a photo birth announcement for your little one. Don't stress we are here to help. And and there's nothing you have to worry about because we've got this covered for you, we are the experts, you just enjoy your new baby and let us take care of the rest. Let us know how we can help and congratulations!